Small-amount short-term lending began in 1994 in response to the initial exemption of such loans from consumer credit regulation. Growing demand for such loans now produces industry turnover of approximately $800 million each year. Regulators recognised early the need for consumer protection due to the vulnerability of borrowers and the emergence of various predatory practices. This led to reforms designed to regulate these loans, prevent particular misconduct and provide remedies against injustice. Some were enacted as part of the National Consumer Credit Protection Act 2009 (Cth), which also imposed licensing and responsible lending requirements on lenders and increased consumer access to remedies. The government has now introduced the Consumer Credit and Corporations Amendment (Enhancements) Bill 2011 (Cth) which limits the price that can be charged for credit and restricts access to small loans. This article examines the extensive reforms which have taken place in this sector, and compares these regulatory approaches with the “bright line approach” of the Enhancements Bill. The article argues that the repercussions of this step will require careful monitoring to ensure that further harm is not suffered by those least able to bear it, and the government will also need to facilitate other, more sustainable, solutions to the problem that small loans are currently used to solve. After this article was completed, the Report of the Parliamentary Joint Committee on Corporations and Financial Services and the Report of the Senate Economics Legislation Committee on the Enhancements Bill were released. These are referred to in a postscript. The objectives of voluntary administration are the saving of companies or their businesses or, failing that, the maximisation of returns to creditors. Therefore, it would appear to be the ideal form of insolvency administration for the protection of employment and the entitlements of employees. A recent empirical study confirms that the returns to employees under voluntary administration are better than those to employees under external administrations generally, but this “good news” is qualified, rather than contradicted, by the continued heavy reliance on the taxpayer-funded General Employee Entitlements and Redundancy Scheme and the decline in the number of voluntary administrations in recent years. This article takes a critical approach to the voluntary administration process in the context of the protection of employee entitlements to consider whether any reform of the law should be recommended. 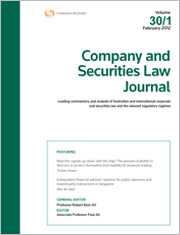 For the pdf version of the table of contents, click here: C&SLJ Vol 30 Pt 3 Contents.